OMG more cards for Trumps Gift Warlock! Not gonna play this fella. Especially against rogues. It's pack filler. It is only good if your enemy got a full hand or if this is silenced. Its better than hoarding dragon, but barely. No way in hell do you play this chit. If nothing else it's good value for silence priest. You may see this in a future co-op brawl too who knows. Part of me wonders if the delayed in the benefit to your opponent is enough to snowball the board. Then again it hasn't worked in the past, but I think this card would have the best shot of it working. i think, even in silence priest, it's very bad. You can't attack with him even once. Coin is too much. Yes, he is overstated, but why silence priest needs more minions, if old silence priest used only 2 4-5, 2 4-8 and 2 7-7. New one can use 2 4-5, 2 5-6 and 2 5-8. Only bad thing - 5-8 is 5 mana, but not too bad. I think, faceless rager so much better for silence priest. 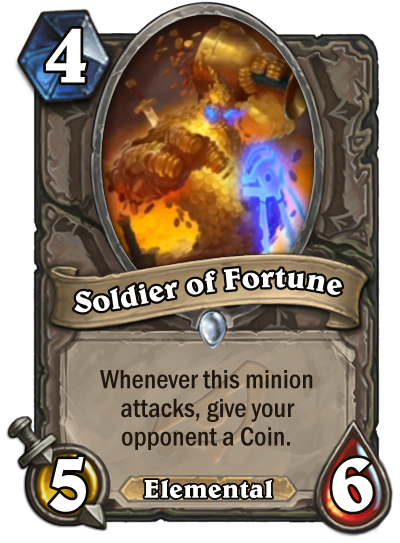 For arena, it's just drop it and concede after 2 your attacks, coz 2 coins crush even with long waiting in dragon. you just can't attack with him, or you will give your opponent so much value and your outcome? +1+1 on stats.